Sharp shards of stone fly into the air above a busy road-stone quarry on the outskirts of Sierra Leone’s capital, Freetown. There are endless mounds of gravel piled up on the steep terrain of the hillside quarry. This would be a challenging working environment for even the strongest and most experienced quarry men. But I witness children as young as three years old navigating the dangerous quarry tracks as they carry heavy boulders and then attempt to break the stones up with their infant hands. 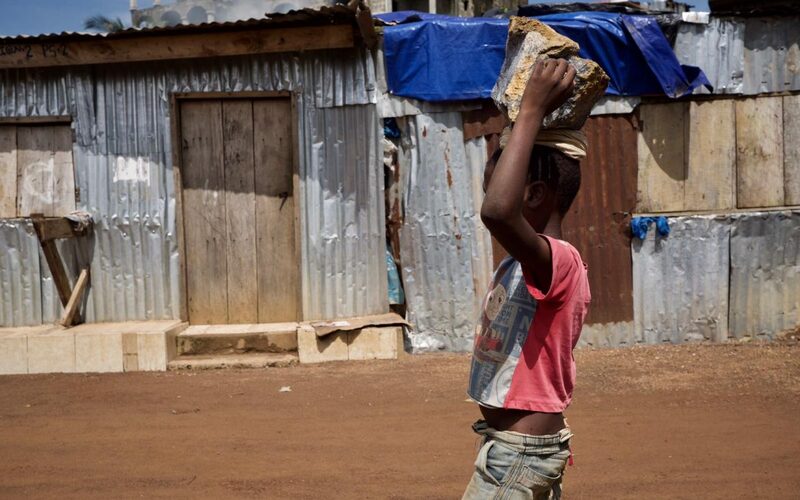 Sierra Leone, devastated by civil war and the Ebola epidemic is one of the ten poorest countries in the world, and these families are being forced to use the labour of their young children in an attempt to make enough money just to buy food. Artefact met a family who relies on the labour of their four children who are just three, five, six and seven years-old. The mother, Mamoso and her husband and children spend their days at the quarry relentlessly gathering and breaking stones. The young family of six works together tirelessly, 10 hours a day, seven days a week. Perching on a boulder, Mamoso looks up to her small family and tells me, no matter what the weather is, they will be working. If they don’t work, they don’t eat. I watch, anxiously, as Ibrahim, the eldest child, navigates the rocky path with a boulder, heavier than I could lift, balanced on his head. I look down and see that the only thing protecting his small feet are a pair of flip-flops, so worn and broken that he basically walks the track barefoot. Turning back I see his younger siblings following him, walking along the same stony track, with only ripped clothes and worn-out sandals protecting their fragile bodies. The daily routine of these young children is physically draining and is representative of the cycle of poverty, so many families across Sierra Leone find themselves in. 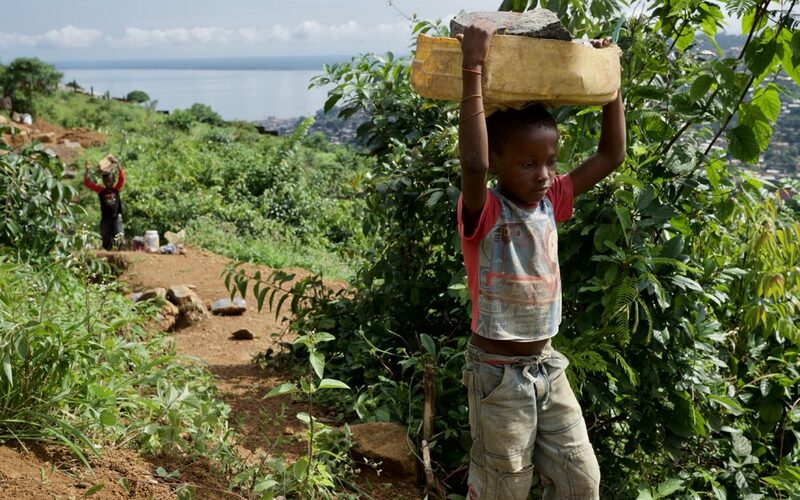 Mamoso and her husband can only watch as their toddler follows the path her older siblings take, carrying a stone above her head, ready to be broken and sold. “The children get wounded, when they don’t break the stones properly they get cut, and they bleed,” says Mamoso. But if the family does not work together to break up and sell the stones, they will have nothing. Mamoso tells me that they can wait up to a month for a gravel buyer. When there’s no money left, they have to turn to the local community to beg and borrow. “I don’t want to do this forever, I’m hoping for the better,” says Mamoso with tears in her eyes. The parents dream that one day they will be able to send their children to school. It’s evident that this family, like so many across Sierra Leone, are struggling to survive from day to day and affording to put their children through education seems to be a luxury so out of reach it’s not even worth comprehending. I can’t help but feel there is little hope for these children to have a better life without intervention and access to an education. 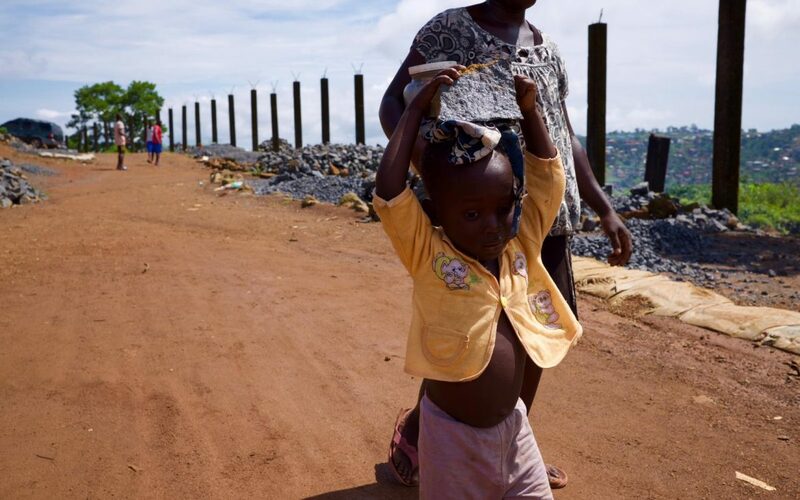 “It’s so heartbreaking to see children this young involved in breaking stones, we believe education is the answer to breaking the cycle of poverty we are in,” says Sanitigie Dumbuya, founder of ‘We Yone Child Foundation’, a small Freetown-based NGO working to improve access to education across the city. In August 2018, the government of Sierra Leone announced that they would be launching a free quality education initiative. Despite this welcome news, people in Sierra Leone are apprehensive, fearing this will be another empty promise. Indeed, the government’s offer of ‘free education’ could be misleading. Only government schools will have access to this support. Schools that don’t meet the government ‘standard’ and ‘mushroom schools’, which are small institutions that have been set up by locals or small charitable organisations to cater for a community where there has previously been no access to education, will not be supported to provide free schooling. Many of the poorest children across Sierra Leone may not benefit from this scheme, meaning access to education could to continue to be a distant hope for the country’s children. “The UK is working with the government of Sierra Leone to help keep children off the streets and get them back in school and learning. UK aid has helped over 400,000 children to receive a decent education and improved the school safety for girls in over 900 secondary schools across the country. 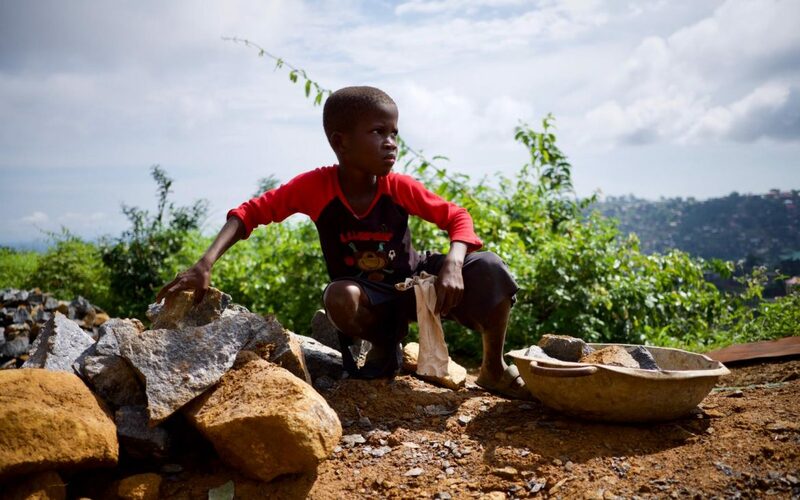 However, without access to education, families across Sierra Leone stand little chance of breaking the cycle of child labour and extreme poverty.